A viral has been created to publicise the disappearance of Madeleine McCann. Its main purpose is to get images of Madeleine out across Europe – and indeed the world – to familiarise as many people as possible with her appearance. The ad is online at YouTube in English, Spanish, Portugese, Italian, German, French and Arabic. Madeleine, of Rothley, Leicestershire, disappeared from an apartment in the resort of Praia da Luz on 3 May. Her disappearance has sparked huge interest throughout Europe. For more information on the campaign to find Madeline McCann see www.bringmadeleinehome.com, www.findmadeleine.com and madeleinemccann.blogspot.com. The video includes information on a 2.6 million pound reward for information. 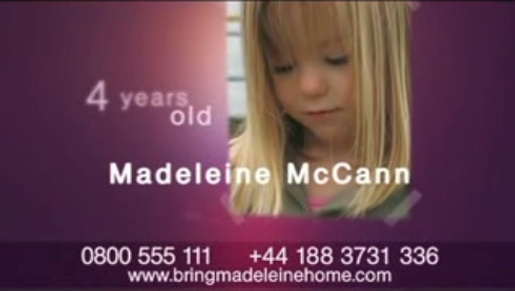 The Madeleine McCann video was developed by BBH, London, Framestore, London, and Zenith Optimedia. Voiceover was provided by Zoë Wanamaker. Zenith has managed to convince broadcasters, including BSkyB, to persuade advertisers to give up airtime by handing over commercial slots to Madeleine TV ads.